When I’m writing, it’s nice to have music that won’t try to distract me. Unfortunately that rules out lyrics and sometimes even melodies. One trick I like is slowing down nice, existing music to the point where it is more of a texture than a song. Here’s a public domain recording of Chopin’s “Anhang,” funded by the Musopen Kickstarter campaign to release free recordings of his entire oeuvre, slowed down by a factor of eight with Audacity’s paulstretch plugin. When I went to upload it, I wanted a cool cover graphic. 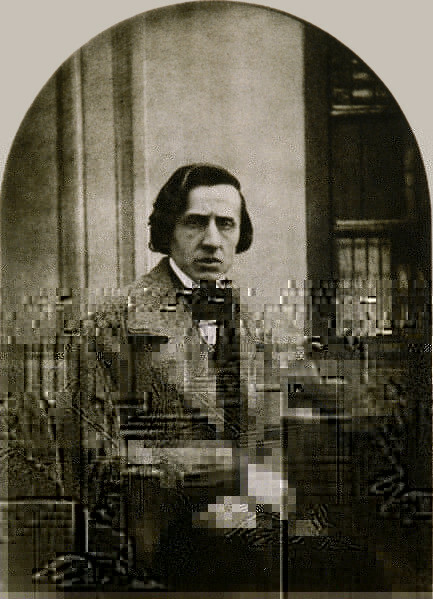 I took one of the only known photos of Chopin, and glitched it manually with a hex editor, entering new values, copying and pasting, and deleting things sort of at random. This was my first time glitching an image like that, and I relied heavily on tutorials from Doc Pop and Steen for how to do it. I couldn’t really get anything to work with a PNG, but once I converted to JPG I was able to get something like this.